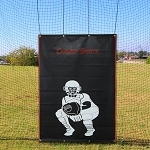 Batting Cage Frames • Discount Prices • Free Shipping! Some people seem to have acquired netting of their own or are trying to rig some other type of batting cage setup - maybe using wire fence mesh - and just need the frame that supports a batting cage net. Others do not want the standard #24 nets that come with many complete cages and want to match up a higher grade batting cage net with a frame. That's what this category of products is for. 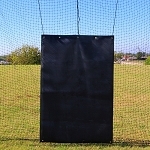 Save money and purchase just a batting cage frame here. 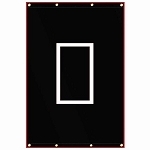 We have several sizes to accommodate most situations. The easiest way to buy a frame is to buy a complete batting cage frame that includes all of the frame corners, net hangers and steel conduit poles. Unfortunately, it is also the most expensive and least economical way of purchasing a batting cage frame. The most economical way of buying a frame is to purchase a frame corner kit, which only includes the elbows and net hangers. You can purchase the steel conduit needed to complete the frame at a local hardware store for less money than it would cost to have them shipped to you in a complete frame package. Another thing to consider is whether you want a batting cage that is designed to be easily put up and then taken down or whether you want a permanent batting cage solution, The residential frames and frame kits are meant to be removable, whereas the commercial frames are designed to be cemented into the ground. As you might imagine, batting cage frames that are cemented into the ground are much more stable and able to withstand high winds that ones that are merely sit on the ground, whether or not you have secured it with ground stakes. PLEASE NOTE: If you are buying a removable residential frame that is not cemented into the ground. It is extremely wise to buy ground stakes, which will help keep the cage upright in light to moderate wind conditions. You should NEVER leave a cage up that is not secured with cement in extremely windy situations.